I thought I’d take a break from our regularly scheduled London programming for another rewind post. This one isn’t from very long ago, but it fell to the wayside in the madness of this summer. My mom and I have a tradition of taking one- or two-day trips to the city for some girl time. The first time we did it was when I was in ninth grade, and having a really stressful time in school. Looking back, it probably was not a very big deal, but I was fourteen and everything was very dramatic. My mom declared it a mental health day in the middle of the week, and we both played hooky and took the Amtrak down to New York. It was late November, so we went to see the Radio City Christmas Spectacular and just walked around, bundled up and taking in the city decked out in its festive finest. After that, we’ve continued the tradition almost every year, making it a different trip each time. We’ve sometimes piggybacked it off of my mom’s business trips, we’ve had friends or family come to meet us, we’ve gone there and home in a day or stayed overnight somewhere, and we’ve mixed trying new things with revisiting old favorites. This was back in 2010, when my mom and I met Mikaela in the city – it was the first time we’d seen each other since getting back from New Zealand! She’d never been to New York before, so we knew we had to take her up the Empire State Building first thing. Our most recent city excursion, back in August, was a perfect representation of this. My mom had a business conference in Manhattan, and I was in my weird post-OBX pre-London limbo with no real commitments or time constraints. We went down a day early, emerged into the sun outside Penn Station, and started the long walk up to our hotel on East 48th Street. Minnie Mouse texting on her down time. Classic. Speaking of these characters, there is a serious Elmo boom going on. We saw three different Elmos hanging around Time Square, at one point all on the same corner (see what I mean about not remembering to take pictures at opportune moments?!). Is Elmo all the kids want nowadays? Mickey and Donald going the way of the dodo? Sad. We checked in to our hotel and set right back out to pick up tickets for a Broadway show that evening (more on that later) and find some grub. We grabbed our tickets and headed out on the advice of the concierge to find a nice place to eat. I don’t even remember exactly where we got to – I think it was generally west side, maybe in the 50s somewhere – but it felt like such a different part of Manhattan. It was really hard to believe it was in midtown! Just a couple blocks west and the noise died away, the buildings shrank down, and trees sprung up along the road (albeit in tiny patches of dirt surrounded by iron grates). The sidewalks were lined with open-air tables spilling out of all the cafes and restaurants. We walked along and finally decided on a little French place right on the corner. In true esprit français, I ordered escargots, which were drowned in garlic butter and absolutely delicious (really, try them, not nearly as slimy as you’d think) but not very pretty, so I’ll spare you the picture. Instead, enjoy this one of my mom’s fantastic seafood salad. Those scallops. Auuuffffhhh (that was a sigh of happiness, if it wasn’t clear). Happily fed, we walked back in to town, where we popped in to Macy’s for a little browsing and shopping before heading up to one of my very favorite spots in New York City: Bryant Park. Bryant Park just has a special little place in my heart. It was a point of familiarity for me before I knew the city well at all. I’ve spent a lot of my solo time in the city there, and a lot of time with special people there. I’ve wandered around it leisurely on my own, run through it frantically in the rain to catch a train, met old college friends for coffee, and did almost the entirety of my GRE studying at a window seat in the Le Pain Quotidien on the southwest corner. I love how it morphs with the seasons and always offers a peaceful place to sit. My mom and I got coffee from our favorite claustrophobic Starbucks on 42nd and sat in the park, people-watching. Eventually it was time for dinner, so we walked around the library and up to Ammos Estiatorio. This place is a gem in Manhattan, people. It’s tucked away on Vanderbilt Avenue, which only runs from 42nd to 47th, so you wouldn’t likely come across it if you were just going along on your merry way. In fact, we first discovered it a few years ago by just picking a random restaurant out of our hotel guidebook. The place has a very authentic Mediterranean flare that is clear from the menu and even the waitstaff. Start with the Greek Bubbles cocktail – trust me. Prosecco, elderflower, and slivered green apple. It’s the bomb. My mom and I couldn’t narrow our choices down, so we decided to order a bunch of appetizers to share instead of individual entrees. This was definitely the way to go – we tried their spanakopita, the completely unpronounceable kolokithokeftedes (zucchini fritters with tzatziki), and grilled tiger shrimp, and absolutely everything was top-notch. Well done, Julie. In my defense, this was the realization of a dream that I’d been holding on to for months. I first saw a commercial for the Broadway production of Newsies back in April, when Abby and I were in Richmond for Color Me Rad. Virginia is a long way from NYC, and I hadn’t finalized plans for being home at all yet, so it didn’t really seem like a possibility. But once my mom and I planned this little trip, I knew we had to make this show! Does it sound overdramatic to say it was everything I’d ever dreamed of and more? Whatever, it was. 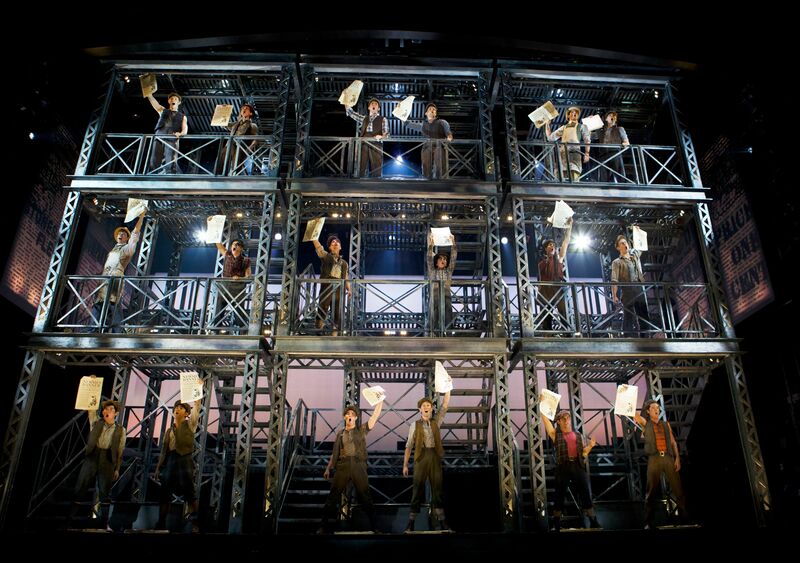 If Newsies comes to London I am buying up every seat in the house. And sitting in them all at once. Okay, this idea needs some work. Anyway, I had to keep remembering to close my mouth because I was smiling like a goon the whole time. I was singing the music nonstop for weeks afterwards. The acting & singing were phenomenal, but my favorite part of the show might have actually been the sets! There were three giant scaffolding-type structures that spun and folded and moved and made up all the different scenes. These crews are so creative with bringing shows to life on tiny stages! The only slight dampers on the experience were the man next to me who accidentally put his hand on my shoulder every time he put his arm around his wife, and the lady in front of us who fell asleep and whose head lolled right back on to my mom’s lap for a good thirty seconds before she woke up. Awkward. After the show, we walked back to the hotel, stopping for soft-serve from an ice cream truck along the way. It’s a good thing that singing out loud is basically the least crazy thing that people do on the streets of New York, because I couldn’t help myself. The next day, my mom had to attend her work conference, so I set out to wander around on my own. I checked out of the hotel, walked through Rockefeller Center to get some coffee, and generally pointed myself north. I didn’t have any set plans for the day except for vaguely thinking I might visit something on Museum Mile if it worked out – I just didn’t feel like scheduling. I made my way uptown, grabbed breakfast to go in Columbus Circle, and headed into Central Park with the idea of finishing the book I’d brought. I sat on a random bench along the footpath for a while, reading away while a multitude of early-morning city joggers whizzed by me. Lamp posts always make me think of Narnia. After an hour or so I was getting a bit stiff on my little bench, so I wandered on to stretch my legs and find a new reading spot. On the way, I discovered a new-to-me spot that I’d never noticed before called Wagner Cove. There was a little sign marking a barely noticeable path that sloped down the hill and ended at a charming little gazebo on the water (which was kelly green – they had some serious algae goin’ on this summer). It was so lovely and secluded and I really wanted to sit and read there, but as you can just barely make out in the photo, there were already gazebo-dwellers in residence. Hmph. No matter, I journeyed onwards. Eventually, I found a perfect rock right by the Lake, and finished my last few chapters enjoying the shade of the giant tree overhead as well as the beautiful views. Having exhausted my reading material, I dusted myself off and kept walking north. I’d never actually explored the entire length of Central Park before – usually just popping in and out from the edges – so I figured there was no time like the present. The farther into the park I went, the less crowded it got, and pretty soon I was meandering along footpaths without seeing another soul for ten minutes at a time (an astounding feat in the middle of Manhattan). There are a lot of wonderful little nooks and crannies in Central Park, and I kept stumbling upon pretty landscaping and intricate old bridges. Under one of the bridges in a rather deserted area of the park, an old Japanese man was playing beautifully haunting music on a bowed, stringed instrument. I gave him a dollar and an awkward smile, to which he solemnly nodded, but the further on I walked, the more I wished I’d stayed and listened a bit longer. I eventually made it up to the Reservoir – farther north than I’d ever been in the park on foot! Unlike the Lake, the Reservoir was astoundingly clear and a perfect mirror of the blue sky above it. I took my time walking around the southeast edge of it, trying to stay out of the way of the ambitious midday runners flying past me. I stopped on the eastern shore to snap a last photo, and then skipped quickly out to 5th Avenue. My mom had suggested I visit the Guggenheim if I got up that far, and as I’d never been before, I thought that sounded like a fine idea. There was a special James Turrell exhibit on feature, and the cathedral-like main atrium of the museum had been converted into a light spectacle, with specially installed floor cushions intended for you to lay on your back and gaze up at the illuminated tiered ceiling (no photos in the museum, sorry). Something in the air seemed to muffle sound, and it was almost hypnotic watching the colored light slowly, slowly change and fade and shift. After a bit, I yanked myself off the ground to explore the rest of the place. The Guggenheim and I got on famously – it is exactly my kind of museum. I really love museums, especially art, but my attention span just doesn’t hold like I’d like it to. No matter how much I’m enjoying a certain exhibit or artist, three hours at most is all I’ve got before my focus is gone. Good old Guggie (ha, sorry, I couldn’t help saying that) was perfect because it’s not at all overwhelming in size. I explored the whole place at my leisure and it took around two and a half hours. My favorite exhibit by far was Kandinsky in Paris, which displayed the artist’s work from the last ten years of his life, when he lived in the French capital. I’ve hardly touched my art minor since college, and this was a nice return to it. I actually took a bunch of notes on my phone about the history of the work in the exhibit, Kandinsky’s life at the time, and my favorite paintings, but they disappeared when I updated my phone the next month, so I’ve got nothing for ya. Boo. After I left the Guggeinheim, I began the pilgrimage down to the West Village to meet my good Geneseo friend Jesse for coffee. Just a casual 90-block walk in mid-August heat. Here’s an awkward tale because I know how you all love those: I’d packed very poorly and was wearing jeans and a long-sleeved shirt, and by the time I was halfway to our meeting point, I was quite honestly inappropriately sweaty. I made a pit stop in H&M, dragged an armful of $11 sundresses into the fitting room with me, and bought the first one that fit. After that, it was simply a matter of ducking into the New York Public Library, changing in one of the basement restrooms, and having a brief and uncomfortable conversation with the security guard who noticed I was wearing different clothes and took his job very seriously. Much refreshed, I made a spontaneous stop at Magnolia Bakery and walked the final thirty blocks eating a red velvet cupcake with my fingers and feeling like I could not be happier. Awhile later, Jesse and I parted ways, having enjoyed an afternoon full of caffeine and college reminiscences. I met my mama up in midtown and we boarded the train to take us back upstate. When my legs really started to ache towards the end of the train ride, I pulled up Google and mapped the route I’d followed, which turned out to be nearly thirteen miles! I’d almost walked a half marathon. Maybe someday I’ll pull an Andy Bernard and walk two marathons… although it’d probably take me two weeks and I’d most likely die immediately afterwards. Anyway, this quick trip to New York with my mom was a continuance of one of my favorite traditions, and one of the highlights of my brief summer at home. It made me feel very fond of the city I’m most familiar with just before I set off for a brand new one. Before long, I’ll probably know London much better than I’ve ever known New York, so this visit was special because it was still my #1. Weird how things change like that, isn’t it?